I am always being asked about feet and it is difficult to give answers when your are not a health care practitioner or Podiatrist. Those of you who have lymphoedema in your feet should be seeking professional help this also includes those of you who are diabetic. What's the difference between a health practitioner and a podiatrist? A Foot Health Practitioner (FHP) is qualified to provide routine foot care and help you to maintain healthy feet. They can assess the condition of your feet give the appropriate treatment and if necessary make a referral. Podiatrists are health care professionals who have been trained to prevent, diagnose, treat and rehabilitate abnormal conditions of the feet and lower limbs. They also prevent and correct deformity, help to keep patients mobile and active, relieve pain and treat infections. Those of you who have lymphoedema in your feet do have to take special care of your feet. 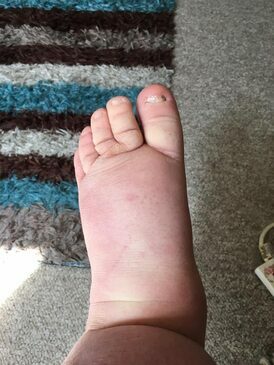 The above photograph is of a foot with lymphoedema and a blister caused by the shoe being too tight. If you look closely you can also see the indentation of the shoe around the heel area. Thank you to the L-W-O member who sent me this photograph and has allowed me to publish. How often as adults do we get our feet measured? Children's feet are usually measured because their size is changing all the time. It is estimated in the UK that over half of us are wearing the wrong size shoes. 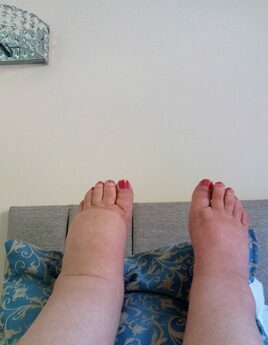 This is not good especially for lymphoedema feet. 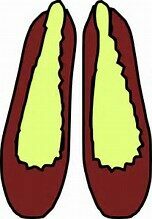 As I have got older my foot size has changed I have gone from a 5 to a 5.5 and my width has gone from standard to an 'E' fitting and depending on the design, quality and make of shoe sometimes I could wear a 'EE' fitting. It is highly likely that as we get older our foot size changes. Feet tend to splay as we get older although I am lucky I still have a good instep. A broad, flat foot, especially one turned outward. 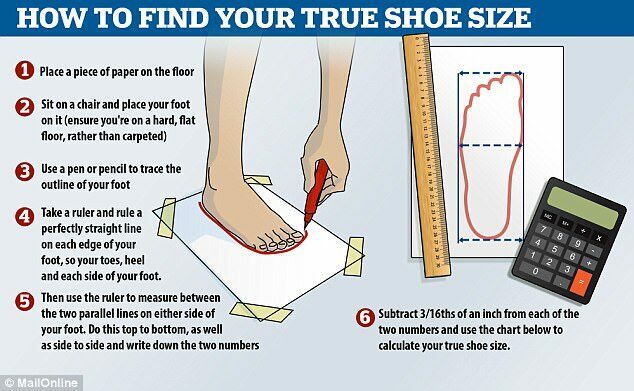 ​​So it is important as we get older we have our feet measured especially those living with lymphoedema or diabetes. I love to go for a manicure and have been going to the same place for 25 years. However, these days I tend not to go for a pedicure. For those of us living with lymphoedema or diabetes that one of the first places an infection can get in is through the feet. Sadly several years ago I caught a fungal infection by having a pedicure. Luckily then I didn't have any health issues. Clearing fungal infections takes a long time. Manicures and pedicures do pose a risk to health if the beauty salon is not scrupulously clean and the tools are not sterilized after every customer. Beauty Salons are not trained to deal with infections and their work however good they might be is only cosmetic. Which is why you should visit especially for your feet a qualified chiropodist or podiatrist. One of the first places that an infection can get into your body is through your feet. Therefore, it is very important to wash your feet every day. 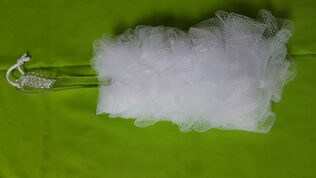 The above scrunchy helps me reach my feet. ​There are so many things that could go wrong with your feet so it is important that you look after them. Signs to look for when foot health is deteriorating. ​​This is by no means the most comprehensive list of things that could go wrong and the tips and advice are to help with self-management. 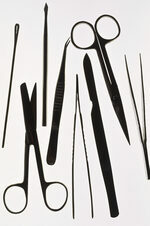 You should always consult your own health care professional and see a foot health practitioner or podiatrist regularly. If you do find an infection treat immediately by using an antifungal cream or antifungal powder. On cracked broken skin use antiseptic cream with a clean dressing. 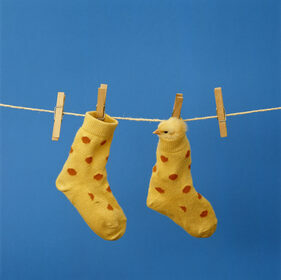 If you are more likely to wear socks in winter to keep your feet warm then make sure you change them every day. This will prevent bacteria building up and being transferred to your feet. Preferably use cotton socks. If you prefer to wear tights, ankle or knee highs, they should also be changed everyday. Good shoes are also important to give your feet the support they deserve. Make sure your socks and hosiery are not too tight and that they do not leave indentations. If possible wear socks that are seamless. Whether you have arm, leg, head or neck lymphoedema, elevating that part of the body is essential to allow the fluid to drain. Thank you to L-W-O member for allowing me to use this photograph. When washing, drying and moisturizing your feet, don't forget the tips of your toes. This could be from a stubbed toe or simply not moisturizing the tips. Every part of your foot needs to be moisturized as part of your daily routine. If your feet are exposed then you will need to moisturize several times a day. Thank you to the L-W-O member for allowing me to use this photograph. 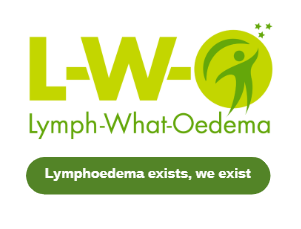 When buying shoes for Lymphoedema feet L-W-O suggests that you shop for shoes when your feet are swollen. The reasoning behind this is that you will not be trying to cram swollen feet into shoes that are not big enough. ​​At the bottom of this page there is a chart and a video that shows or suggests the best way to buy shoes. L-W-O recommends that you have your feet measured on a regular basis. L-W-O always recommends that when you buy new shoes that you allow the time to break them in. There is nothing worse than going out in a pair of shoes for a full day that you haven't had time to get used to. How many times do we buy shoes for a special occasion and by the end of the day come home with aching legs, sore feet and blisters. Someone I know went to a wedding, wearing new shoes for the first time. 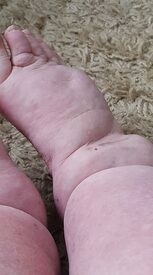 This person did not have lymphoedema but did develop blisters that turned to Cellulitis. Weeks of antibiotics, hospital visits followed and quite a long recovery time. All this can be done in the comfort of your own home, you are not likely to damage the shoes before that special occasion and you save yourself a lot of misery. Most of us cannot begin to imagine how difficult it is to buy shoes for someone who lives with lymphoedema in their feet and legs. Buying shoes is a nightmare. Each foot is likely to be a different size and as we know shoes are sold in pairs. There is no consideration from manufacturers that feet could be so different. Fashionable shoes, heels become a thing of the past. 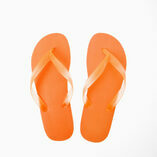 This is where I get into trouble, I am constantly suggesting to our members that they do not wear flip flops. I have lost count of the times that I am told "I don't know what I am talking about" or get told "I am still going to wear mine". You can apply sunscreen to the top of your feet but do not apply to the bottom as it will make walking slippery making it hard to keep your footwear on. I have spent quite a bit of time and effort researching the damage shoes can cause to feet and of course the articles on flip-flops do head the list as not being suitable for lymphoedema feet. Flat shoes like 'ballet' shoes can also cause a problem because they compress the fluid at the top of the foot and this can cause further pain.